The office of sheriff has a long history in Pennsylvania. Its origins can be traced back to colonial days, an influence of early Dutch and English settlers. The Constitution of the Commonwealth was written to include a requirement that all counties have a sheriff. Sheriffs have been elected by the people since 1838. Prior to that time, voters chose two or more candidates, from whom the governor chose one to fill the position. See Chronology Of County Sheriff’s. The sheriff performs various duties and has much responsibility. The sheriff is a “peace officer”, mandated to keep the peace and quell disturbances. He can make arrests, conduct searches, seize property that is used illegally, remove nuisances, and issue firearm licenses. A sheriff can also act as a coroner when that office is vacant. Originally, sheriffs were in charge of jails and prisons throughout the counties of Pennsylvania, however, this is no longer common practice. He also performs tasks concerning the maintenance of order during elections. The sheriff is an “Officer of the Courts”. He serves writs, processes, orders, and notices issued by the courts. He takes part in the selection of jurors and is responsible for summoning them. The sheriff makes civil arrests, takes bail in civil cases and conducts prisoners to their place of confinement. He is responsible for the execution of various judgments of the courts, including the sale of real estate and personal property. After such a sale, the sheriff distributes the proceeds to the parties entitled to them and makes a return to the court. The Sheriff and Deputy’s are always available and will be able to assist you with most of your questions or concerns you may have. Enter the doors of the Government Center and pass through security. The Sheriff’s office is the first office on the right once you pass through security. If there is an emergency, you may dial 911 to obtain emergency assistance. 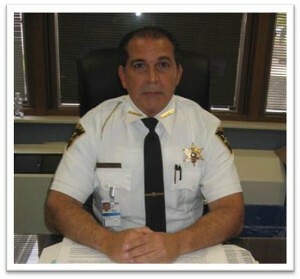 The Sheriff performs various duties and has much responsibility in serving the courts and the public. If you require a meeting with the Sheriff, it is best to call prior to visiting to ensure he is available to meet with you. Our deputies are always available and will be able to assist you with most of your questions or concerns you may have.